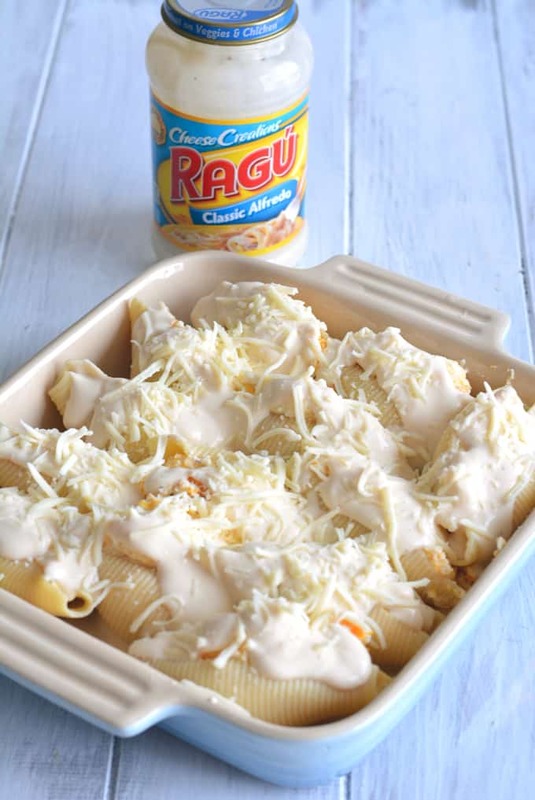 Thank you to Ragu for sponsoring this post and creating high quality sauces that make meal prep quick and easy. 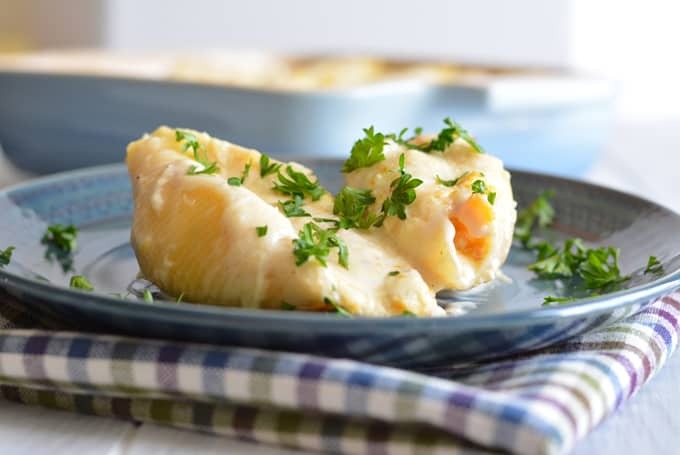 This Fall inspired recipe is a different twist on the traditional stuffed shell recipe. I graduated from college 17 years ago, but I reference that time in my life a lot especially when it comes to cooking. This is where I learned to be a dietitian of course. However many people think that as dietitian we learn to cook as well, but we don’t. It wasn’t in class that I learned to cook for myself. It was living in an apartment with three other girls that taught me a lot about cooking. We cooked meals on our own as well as together. I cooked a lot with my roommate Loretta whom I lived with in the dorms as well. She came from a big Italian family that cooked meals from scratch in a big way. She was the only college student I knew who brought a gigantic stockpot from home! I always thought that it was very nice of Loretta to share her families recipes. Sometimes family recipes are guarded secrets. This reminds me of the story of Assunta Cantisano the founder of Ragu. Assunta came to this country with her family’s secret recipe for tomato sauce. During the Depression, when she began to make the sauce and sell it to neighbors, the sauce became so popular that a business began. One of the meals we cooked together was stuffed shells. I helped Loretta stuff the shells, since that was the most tedious part of the prep. I have made her recipe for the past 17 years the exact same way that she taught me. Only recently have I started experimenting with different variations. This Fall I have become a bit obsessed with butternut squash. It seemed only natural do add butternut squash to the ravioli recipe. Loretta’s recipe of course used a tomato sauce (her homemade of course), but a red sauce to me just did not fit with butternut squash. So this recipe uses an Alfredo sauce. I really like the combination of a cheese based sauce with butternut squash. I roasted the butternut squash ahead of time. I buy butternut squash already pealed and cubed. You can roast a whole butternut squash if you wish, but I don’t like to mess with the skin and seeds. 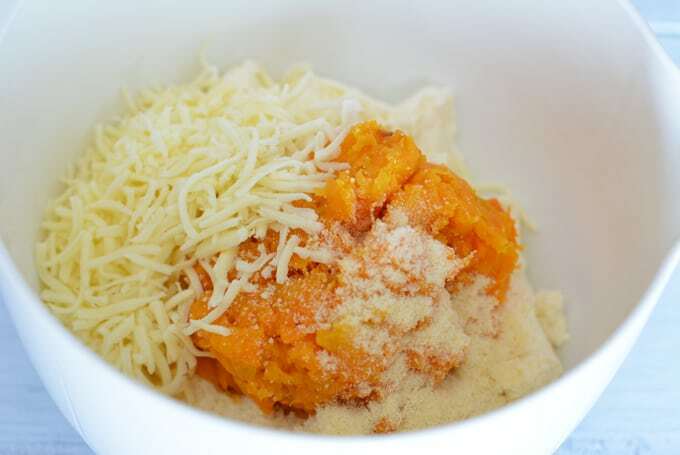 The butternut squash is mashed and then mixed into the cheese mixture. You could puree the squash if you want, but I like the squash a bit chunky. Once you mix the stuffing mixture the shells are ready to be stuffed. I like to cook the shells ahead of time so they cool a bit. I have tried to stuff the shells when the shells were rather warm. I’m not a fan of burning fingers! To avoid having the shells stick to the bottom of the baking pan, spread about a 1/4 cup of sauce onto the bottom of the baking pan prior to adding the stuffed shells. Top each shell with a about 1 tablespoon of sauce. You use about 1 cup of sauce total for the entire recipe. As a dietitian I would normally recommend that you use a tomato based sauce since they are lower in fat and calories than cream sauces. This recipe though uses such a small amount of Alfredo sauce that the additional calories are not an issue. See, all foods can fit! Drizzle olive oil over butternut squash cubes. Place squash onto a baking sheet spreading the cubes out so they are not touching each other. Roast butternut squash in an oven heated to 400 degrees F.
Roast squash for approximately 45 minutes or until tender, then let cool. Meanwhile cook pasta shells according to package directions, let cool. 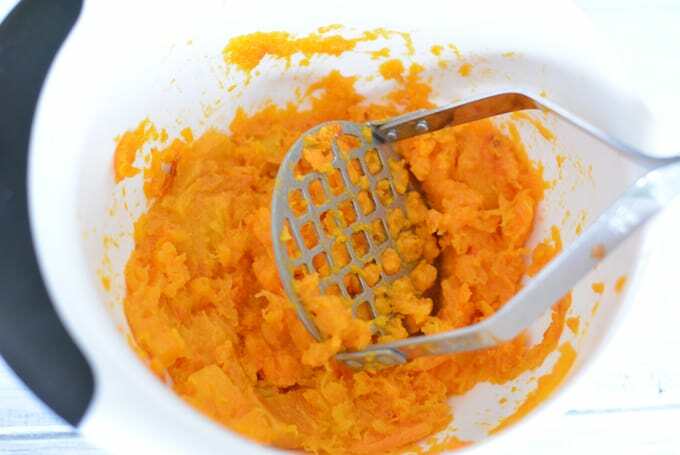 Mash butternut squash using a potato masher or fork. In a medium bowl place butternut squash, ricotta cheese, mozzarella cheese, Parmesan, basil, salt, and pepper. Stir and combine well. 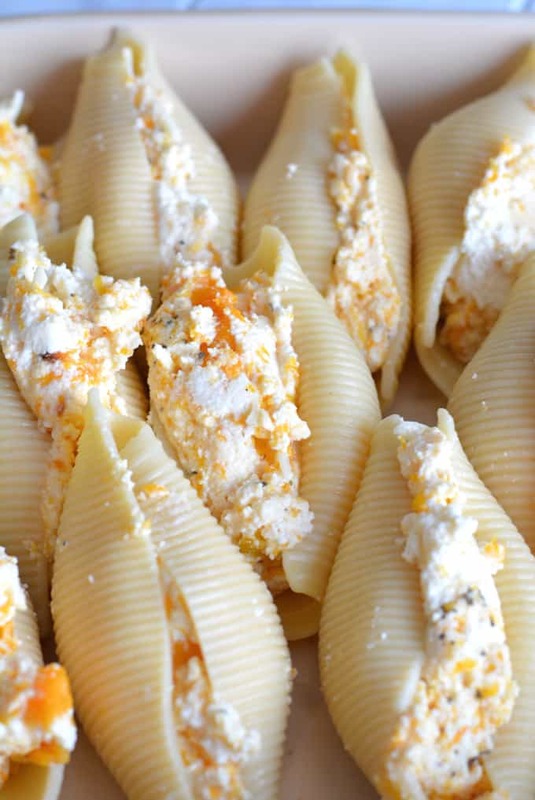 Place 1 1/2 to 2 tablespoons of cheese mixture into each shell. 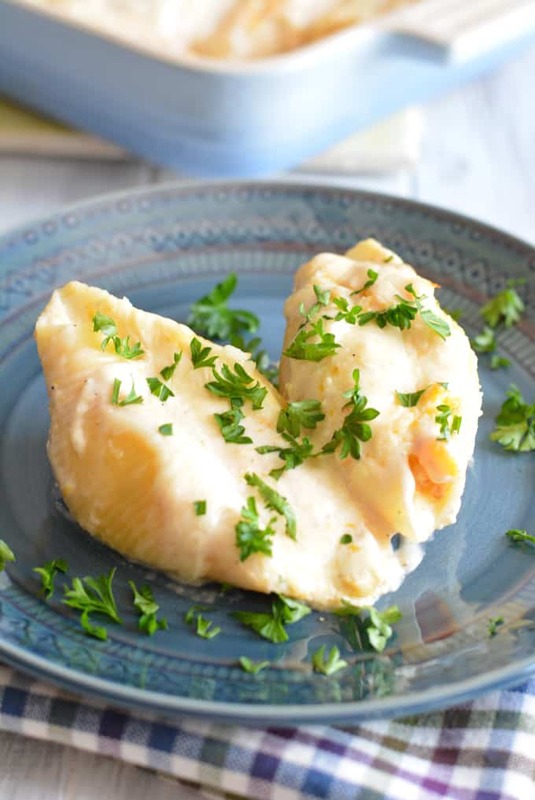 Place stuffed shells into a baking sheet that you have coated with 1/4 cup of Alfredo sauce. Spoon remaining sauce over tops of stuffed shells. 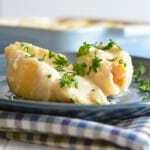 Place stuffed shells into oven and bake for 20-25 minutes or until cheese is melted. Top with additional mozzarella cheese if desired. I absolutely LOVE how you stuffed the butternut squash! So delicious! love the idea of getting squash into the baked shells! butternut squash and cheese just go together so well – so much better than one would think. I use it in my lightened up mac and cheese! Love that you used an alfredo sauce but kept it light by only using 1 cup total. These photos are gorgeous. Interested to know why you cubed the squash rather than roasting whole, which would have been easier. Was there a specific reason? more caramelization of the squash? I buy butternut squash already cubed. I get frustrated trying to cut up butternut squash. You can use either whole or pre cut. ah, that makes sense! I hate cubing squash – always afraid i’m going to slice my hands!